Turkish Foreign Minister Mevlüt Çavuşoğlu said Ankara expects more support from EU member states in counterterrorism efforts at the High-Level Political Dialogue Meeting in Turkey’s capital Ankara on Thursday. “Counterterrorism is important for both Turkey and the EU. Both Turkey and EU member states have been subjected to terror attacks. It will benefit both sides to have close cooperation in every regard. It is our natural right to expect solid support from the EU,” Çavuşoğlu said. 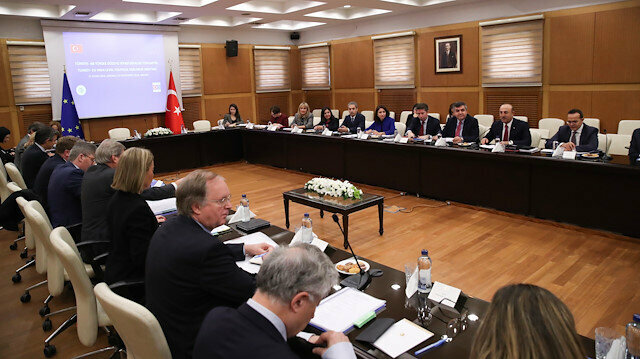 High Representative of the European Union for Foreign Affairs and Security Policy Federica Mogherini, EU Neighborhood Policy Minister Johannes Hahn and Head of European Union Delegation in Turkey Ambassador Christian Berger participated in the meeting. Turkish Foreign Minister Mevlüt Çavuşoğlu poses for a photo with EU foreign policy chief Frederica Mogherini and EU Neighborhood Policy Minister Johannes Hahn before the Turkey-EU High Level Political Dialogue Meeting in Ankara on November 22, 2018. The foreign minister also said relations between Turkey and the EU as well as the accession process was discussed. "We highlighted the strategic importance of Turkey-EU ties. It is no use to make statements excluding Turkey in the EU accession process or denying its candidacy," Çavuşoğlu said. “It is in the interest of both parties to update the customs union. There have recently been interruptions in the Instrument for Pre-accession Assistance on the EU’s side. These interruptions will not ruin the Turkish economy, but it will negatively impact the image of the European Union,” he added. High Representative of the European Union for Foreign Affairs and Security Policy Federica Mogherini welcomed Turkey’s efforts to improve relations with the EU. Turkey's ruling Justice and Development (AK) Party spokesman on Wednesday said a possible coalition in the local elections with opposition Nationalist Movement Party (MHP) "is looking positive. "Speaking to media in capital Ankara after President Recep Tayyip Erdoğan, who is the head of the ruling party, and MHP leader Devlet Bahçeli's meeting in the Presidential Complex, Ömer Çelik said: "I can say that we are in a positive position for collaboration [with MHP] in local elections. "Çelik said deputy chairmen of the two political parties will gather in the upcoming days to present their reports to the party heads on the possible alliance in the local elections and then Erdoğan and Bahçeli will meet again.Today’s meeting between the leaders lasted 55 minutes.Turkey constantly warns Europe of PYD/YPG threat: Envoy"[It was] a very pleasant meeting. We are in a very positive spot in terms of collaboration in the local elections," Çelik said, without elaborating.The spokesman also said AK Party will unveil its mayor candidates for Istanbul, Ankara and Izmir, as well as for 40 other provinces on Saturday.Last month, Erdoğan praised People's Alliance and said: "We see the People's Alliance as one of the most important gains of our country recently, and we want to carry it into the future. "The People’s Alliance -- formed early this year, ahead of June general elections -- includes the AK Party and MHP as well as the much smaller Grand Unity Party.The president said they never did anything which will harm the spirit of the alliance, adding that his party will not be involved in any action against it. 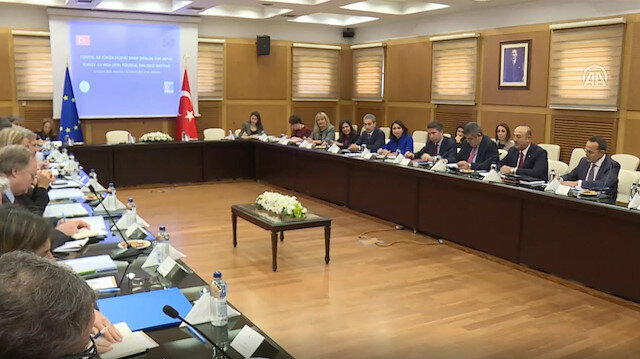 Çavuşoğlu said visa-free travel was also discussed during the meeting. “There were seven out of 72 criteria left for visa liberalization. This fell to six. We also discussed what could be done in today's meeting. Hopefully, we will pass on to visa-free travel soon,” he said. A transparent and credible investigation into the killing of Saudi journalist Jamal Khashoggi has not yet been completed, Federica Mogherini, the European Union's foreign affairs chief, said. “Those responsible for the killing of Khashoggi should be held accountable,” she added. Çavuşoğlu said the investigation was taking a long time and that the international community expects an international investigation. The U.S. has continuously supported Saudi Arabia because of oil, Iran and terrorism, however, these reasons are becoming increasingly indefensible, according to a foreign policy expert. The Eurasia Group Foundation (EGF)'s Mark Hannah responded to U.S. President Donald Trump's support for Saudi Arabia, despite reports the CIA concluded with high confidence that Saudi Crown Prince Mohammed bin Salman ordered the killing of journalist Jamal Khashoggi.Khashoggi, a Saudi journalist and columnist for The Washington Post, went missing after entering the Saudi Consulate in Istanbul on Oct. 2.After initially saying he had left the consulate alive, weeks later the Saudi administration admitted he was killed there.Trump maintained in a statement the U.S. needs Saudi Arabia because of its oil, its willingness to counter Iran and its ability to counter terrorism in the region.However, Hannah wrote that "none of these holds water. "According to Hannah, the U.S. support for Saudi Arabia has led to a war in Yemen that is "one of the worst humanitarian crises in our lifetime," he wrote in the opinion piece for NBC News.As the conflict enters its fourth year, around 14 million people in Yemen, or half the total population, are at risk of famine, according to the U.N."Saudi Arabia, long a problematic U.S. partner, has gone rogue, and Washington’s stubborn support for it is increasingly indefensible," Hannah wrote Tuesday.Hannah, a research fellow at EGF, said the U.S. has surpassed Saudi Arabia and Russia as the world's leading producer of petroleum, and that the Saudis need to export their oil more than the U.S. needs to import from them.He argued the notion that Iran is poised to dominate the Middle East and that the Saudis are a bulwark against terrorism are false.In fact, Hannah said the idea that the Saudis can help in the fight against terrorism "seems downright foolish," noting that 15 of the 19 hijackers involved in the Sept. 11, 2001, attacks were from Saudi Arabia.There is also a “longstanding and close relationships between al Qaeda and the religious components of the Saudi government,” according to the lead attorney in the case of the attacks, he said.It is up to Congress to end U.S. military support for Saudi Arabia, and then ask questions of Washington’s approach to the Middle East, according to Hannah. "It is long past time to start rethinking our foreign policy in the Middle East, which is centered around unnecessary and untenable support for one of the world’s most repressive autocracies," he wrote. Slain journalist Jamal Khashoggi was barred from media appearances after criticizing U.S. President Donald Trump in late 2016, according to the State Department.In its most recent report on Saudi Arabia’s human rights record, the department said Khashoggi moved to the U.S. in "self-exile" in September 2017 and "could face arrest upon returning home" due to his writings.The report said Khashoggi's column in Saudi newspaper al-Hayat had been cancelled under political pressure.“In 2016, authorities purportedly banned him from writing, appearing on television and attending conferences as the result of remarks he made that were interpreted as criticizing the president of the United States, according to multiple media sources. "Earlier, in July, authorities reportedly lifted the writing ban against him," said the report. The ban came after Khashoggi appeared at a policy forum at think tank The Washington Institute on Nov. 10, 2016 and made remarks critical of Trump’s Middle East policies, describing Trump's stance on the Middle East as "contradictory".Khashoggi, a Saudi journalist and columnist for The Washington Post, went missing after entering the Saudi Consulate in Istanbul on Oct. 2.After initially saying he left the consulate alive, the Saudi administration admitted weeks later that he was killed there.Turkey accuses US of turning blind eye to Saudi killing of KhashoggiTrump defends Saudi Arabia despite Khashoggi killingHis body has yet to be returned to his family amid reports that it was chemically dissolved.In a statement Tuesday, Trump defended relations with Saudi Arabia despite the killing of the journalist amid reports that the CIA had concluded with high confidence that Saudi Crown Prince Mohammed bin Salman ordered Khashoggi's murder.However, the president said the U.S. may "never know all of the facts" and the country will continue its relations with Saudi Arabia in order to pursue American interests. "Our intelligence agencies continue to assess all information, but it could very well be that the Crown Prince had knowledge of this tragic event – maybe he did and maybe he didn’t!" Trump said in the statement, which was released by the White House.